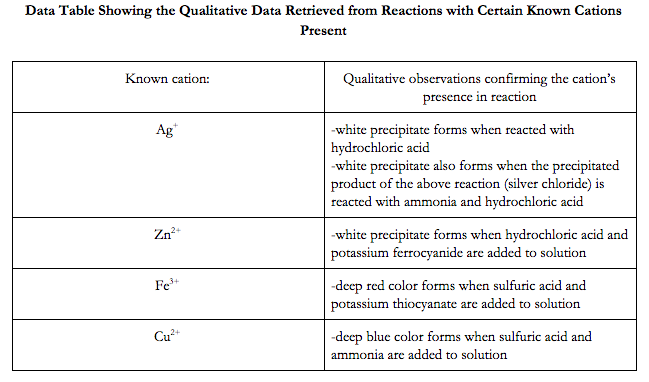 The objective of this lab was to test an unknown solution to successfully determine what cations are present in the unknown solution by using qualitative observations of reactions the solution is put through. Solutions containing an Ag+ ion will generally appear white or clear. Solutions containing Cu2+ ions will generally appear light blue or cyan. Solutions containing Zn2+ ions also generally appear white or clear. Solutions containing Fe3+ ions generally appear a rusty dark red. After adding the hydrochloric acid and observing the white precipitate form, we can confirm that the Ag+ ion is present as none of the other ions possible in the solution would form a white precipitate with hydrochloric acid. The precipitate formed by silver is silver chloride or AgCl. The fact that the precipitate is white also raises suspicion that the Cu2+ ions and the Fe3+ ions are not present due to the fact that they would make turquoise and dark rust colored precipitates when reacted with hydrochloric acid. However none of the other ions can be removed from consideration. The Na+ ion, the K+ ion, the Ba2+ ion, and the Zn2+ ion cannot be disconsidered as they would all form soluble products with chlorine (NaCl, KCl, BaCl2, and ZnCl2 respectively). This leaves it so that they could be left over in the supernatant of the test tube while the silver is in the precipitate. Right off the bat, we can eliminate the silver cation from possibly being in the original solution as there would have been silver chloride that precipitated after the hydrochloric acid was added. However, this does not eliminate the copper or zinc cations from possibly being in the original solution as they would both form aqueous products with the hydrochloric acid, copper (II) chloride and zinc (II) chloride respectively. While the copper is not eliminated as a possibility in the addition of the hydrochloric acid, it is eliminated in the addition of the sodium hydroxide. With the addition of the sodium hydroxide, the copper would have reacted and precipitated out of the solution into copper (II) hydroxide. Because of the lack of precipitate, we can eliminate the copper cation. That leaves us with the possibility of the zinc cation. When sodium hydroxide is added, the zinc cation would react, forming aqueous zinc (II) hydroxide. Thus, because the zinc would not have precipitated in both reactions, it is the only remaining possibility and while it is possible, it is still undetermined. With that said though, it would zinc (II) sulfate is soluble in water. And thus the fact that the precipitate dissolves when sulfuric acid is added cannot be used to validate our conclusions regarding the presence of Zn2+. Upon reacting with sodium hydroxide, both the Cu2+ and the Fe3+ cations would precipitate out of the solution. Copper (II) hydroxide, tlue he product of the cupric ion forms a light turquoise precipitate while iron (III) hydroxide forms a darker rusty red precipitate. Because the precipitate observed in the situation is of the darker variety, one might begin to suspect that the Fe3+ cation was present in the original solution and can rule out the presence of the turquoise copper precipitate. The Zn2+ ion would also react with the sodium hydroxide and would too precipitate out of the solution. However zinc (II) hydroxide is white in it’s precipitating form. Because of the fully dark color of the precipitate in the situation without any white particles standing out, one might begin to think that the Zn2+ ion is not, in fact, present. The suspicion of ferric’s presence is further validated when sulfuric acid is added and the precipitate previously formed disappears. This makes sense with the ferric ion as the product of sulfuric acid and the iron (III) hydroxide in the dark precipitate is iron (III) sulfate which is soluble in water, thus causing it to disappear. Finally, with the addition of the ammonia, the dark precipitate reappears. This only confirms the presence of iron as the iron (III) sulfate from the previous step would react with the ammonia and would form the precipitate of iron (III) hydroxide again as well as ammonium sulfate. The iron (III) hydroxide precipitate is what was suspected to have been the dark precipitate from earlier and the fact that it showed up again supports the conclusion that the Fe+2 ion was present in the original solution. If hydrochloric acid were unavailable to use in the experiment, these student could use a variety of other chloride salts. As long as the product of the reaction with silver in it precipitates out of the reaction, the acid will work. One example for this would be sodium chloride or NaCl. Because the silver chloride that is produced by this reaction will precipitate out, the sodium chloride will work just as well as the hydrochloric acid. The reaction for this example would be AgNO3(aq) + NaCl(aq) → NaNO3(aq) + AgCl(ppt). A complex ion is a molecule with a metal ion at the center of its structure with other atoms or molecules surrounding it. These outer molecules or atoms are referred to as ligands. There are many examples of common ligands, including but not limited to, water, chloride ions, and ammonia. For example, in step 7, this complex molecule, the ammonia molecules are the ligands and the silver ion is the metal ion at the center. If a barium cation had been present as a fifth cation, we would be able to test for it directly after precipitating the silver out of the solution. To test for the barium we would take the remaining supernatant from the precipitation of the silver, now without the silver, and react it with a solution of sodium sulfate. This sulfate would react with the barium cation in the solution to produce barium sulfate which would then precipitate out of the solution. This would not conflict with the iron, copper, or zinc ions that are still present in the solution as sodium is higher than them in the reactivity series and thus would not be able to replace the sodium in the sodium sulfate. However, barium would be, which is why the step would be successful. Overall, we achieved our goal of determining the ions in an unknown solution by qualitative analysis. In our lab, we decided to test unknown solution C. We identified that out of the possible cations present in unknown solution C (Ag+, Cu2+, Zn2+, and Fe3+), only Cu2+, Zn2+, and Fe3+ were present. We discovered this by putting our unknown solution through a set of tests and reactions and comparing the observations of our unknown solution to that of a solution with all of the possible cations present. In our testing of the known solution (all cations) we found that to separate silver, a white precipitate needed to form after the relevant reactant was added to the known solution in the first step. The precipitate was then extracted, dissolved, and reacted again with a different reactant and if another white precipitate formed, the presence of silver was confirmed. The iron and copper cations were then separated from the remainder of the known solution and a precipitate was formed out of them. The precipitate then underwent a reaction in which a deep blue color was observed, confirming the presence of the copper cation. The remaining precipitate from this copper reaction was then reacted and a rusty red color was observed, confirming the presence of the iron cation. The final remainder of the known solution was then put through a reaction in which a white precipitate formed, finally confirming the presence of the zinc cation. With these observations on the tests of the known solution, we were able to successfully qualitatively analyze the unknown solution for the presence of the cations. The first reaction we put the unknown solution through was to separate the silver cation precipitate from the rest of the solution. However, we found that no precipitate actually formed, indicating that there wasn’t actually any silver cation in the original solution. We then used the remaining solution and separated what would be the solution containing the zinc cation and the solution containing the iron and copper cations. We were able to successfully confirm the presence of zinc cations in our original solution when we observed that through our reactions, we had formed the white precipitate of potassium zinc hexacyanoferrate (II). We were also able to confirm the presence of copper ions in our original solution when we observed that upon the addition of ammonia, the solution turned to the deep-blue of tetramine copper (II). In this same step, the iron precipitated out of the solution and we were finally able to confirm it by creating a solution with this precipitate, reacting it with thiocyanate, and noticing the deep-red color of the pentaaqua thiocyanatoiron (III). Because our results didn’t have much to do with yield, errors in this lab were far from extensive. However, there were small errors that we made that slightly altered our experiment and flaws in the experimental procedure that, if fixed, could make this experiment more successful. The first and most noticeable flaw in the procedure was the fact that there was almost no effort put into the separation of supernatants and precipitates. For example, most of the time we just used pipettes to empty a test tube of a solution, often leaving the precipitate soaked in the supernatant or a little precipitate in the pipette. This could have had a negative effect on our experiment as it could have left contaminants in the precipitate or supernatant, possibly reacting with some reactant in the next step of the procedure and giving us deceiving information about the reaction and thus making our observations invalid. This flaw could be fixed by adding an extra step to each part to clean the precipitate or using more sophisticated equipment to extract the supernatant and then filtering it to get rid of all of the precipitate. Another flaw in the experiment was that we may have added too much reactant at some points as it was not always clear how much to add to the solution. This extra reactant could have easily stayed in the solution and reacted with something we didn’t want it to react to. This too could have given us false information on reactions and could have lead to our observations becoming invalid. In addition to errors within the experiment, there were also limitations to the lab itself, such as the fact that only quantitative tests were used. One flaw with this was that we were not actually able to confirm what that white precipitate we formed actually was. Using more tests to confirm the precipitates would have been beneficial to our procedure and would’ve helped us more accurately confirm the presence of the cations. For example we could test the precipitate in the final step using a melting point test to confirm that it is, in fact, potassium zinc hexacyanoferrate (II) and not some other white precipitate. With the errors fixed and the limitations taken care of, this lab can be even more successful than it already was. Fe3+ + 6H2O → [Fe(H2O)6]3+. This hexaaquairon (III) appears a violet reddish color which is why aqueous solutions containing ferric ions often appear this way. This phenomenon of metal ions being dissolved in aqueous solution is known as having an aqua ion. Because these aqua ions are larger than the free metal cations alone, they are able to actually absorb and reflect light, causing them to display their respective colors.